Like Nick Rosen in Off The Grid, Shannon Hayes begins her book, Radical Homemakers, Reclaiming Domesticity from a Consumer Culture, with a history lesson in Part One: Why. Hayes discusses the role of homemakers and how the position has changed so drastically in so little time. Skilled homemakers who used common knowledge to provide for their families were replaced in the rampant consumerism and convenience craze that started early last century. Electric appliances, packaged (processed) food, and the automobile turned skilled homemakers into consumers instead of producers. The problems only grew worse as more women- many seeking more meaningful lives outside of buying and chauffeuring for their families- entered the workplace. As future farmers and homesteaders, Eric and I aspire to live off the grid- providing our own electricity, water, and sanitation needs without the power and utility companies. 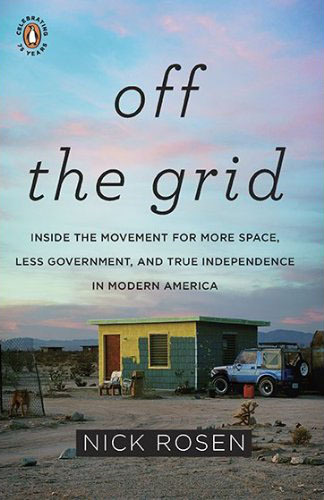 Nick Rosen’s Off the Grid, tackles the complex question: why do people live off the grid? The first section of the book provides the reader with a bit of a history lesson, describing the early days of electricity, explaining the industrialization of electric and water suppliers, and discussing the new era of the so-called “super grid.” There were more than enough reasons in just the first chapter to make me want to live off the grid. The second (and larger) part of the book chronicles Rosen’s adventures around the US, seeking out and meeting people who live off the grid. Rosen has categorized the off-gridders based on their motives- some choose to live off the grid to be more in tune with nature or to be self reliant, while other people have no choice, unable to pay for the utilities (or even a place to live), or living in an area not serviced by the grid. Through the journey, Rosen shares a lot of reasons why people live off the grid, but I wish that some sections had been more detailed, specifically how some off-the-gridders implemented their self-reliant lifestyle. There is little mention of how his subjects access water or handle their waste, though Rosen includes water and sanitation in his definition of the grid. Fortunately, Rosen has a website, with a blog, forums, and other resources that have answered all of my concerns. If you’re interested in homesteading and self-sufficiency, you should really check it out at off-grid.net. However, Mark and his family realize that the island life isn’t for them. They move back to California and Mark finds himself on a new path after collaborating to create and edit the DIY magazine, Make. With inspiration and motivation from other DIYers in his life and online, Mark starts a garden, converts a shack into a chicken coop (and sets up an automatic door to let the chickens out every morning! ), collects and keeps a native bee population, and even creates his own musical instruments. Throughout the book he describes the processes he follows, sharing his accomplishments and defeats with grace and humor. Sallie gave us this book not knowing if it would apply to us or if we’d like it- she was right on the money! Now we’ll have to figure out how to make our own automatic door for the chicken coop! P.S. 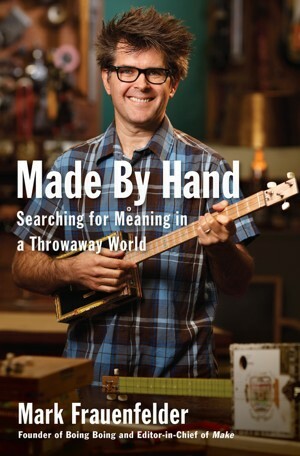 While we’re talking about “made by hand,” Eric got me a fantastic novel last year called World Made By Hand by James Howard Kunstler. It’s a post-apocalyptic story that describes a town learning to live off the land and off each other in the face of violent gangs and corrupt politicians. Definitely worth a read. Similar to Possum Living, this book outlines a process by which one can become self-sufficient; however, the context is radically different. Instead of choosing a stress-free life outside of the “money economy” like Dolly Freed, Wendy Brown labels herself a “thrivalist,” a term which she uses to describe “survivalists” who plan to thrive in a post-apocalyptic, petroleum-free world, otherwise referred to as “the end of the world as we know it” (abbreviated to TEOTWAWKI). 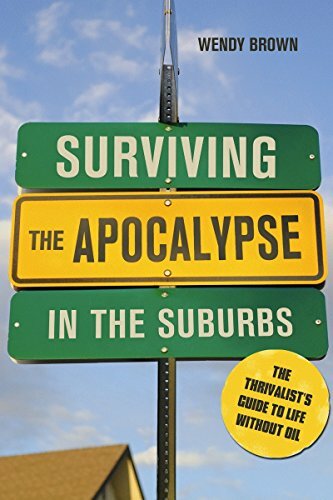 Surviving the Apocalypse in the Suburbs presents a perhaps-not-so-hypothetical situation: there are 21 days before the apocalypse, and we must prepare for a future without electricity, grocery stores, and other modern conveniences. The book is divided into 21 chapters, one chapter for each day of “prepping”- starting with the basics of shelter, water, and food, and progressing to more complicated issues like healthcare, education, and waste disposal. Wendy does make the assumption that the reader lives in the suburbs, which renders some of her points, like storing human waste in a septic tank, moot for some readers. Overall, the book goes into more detail than Possum Living and is every bit as easy and interesting to read. The tips on gardening, herbal remedies, laundry, and staying entertained were especially enlightening. You can preview several chapters of the book on Google here. Wendy also has a blog about her thrivalist activities and thoughts, which is worth a look. This winter- thanks to our unemployment- we’ve had the time to tackle projects we’d been putting off and plan new projects for the spring. We’re also reading and researching as much as we can to prepare us for the future. Possum Living was published in 1978 by eighteen-year-old Dolly Freed. She had dropped out of school in 7th grade and detailed the life she and her unemployed father lived outside of the “money economy.” They already owned a house and land outside of Philadelphia, and spent money only on essentials and taxes. Without jobs, they happily spent their days gardening, fishing, raising chickens and rabbits, bird watching, running, cooking and preserving, and doing other jobs around the homestead (including making wine and distilling their own whiskey). In the book Dolly provides helpful step-by-step instructions and recipes that are still relevant to homesteaders and survivalists today. The new edition of the book includes an afterward from Dolly over 30 years later. She joined the “money economy”– to become an aerospace engineer at NASA. No kidding! Soon after the original book was published, she earned her GED, studied for and aced the SATs, put herself through college, and ultimately was awarded her dream job at NASA. (It turned out not to be her dream job, and she now works as an environmental educator at a nature center.) Though her true homesteading lifestyle lasted only about 5 years, she still incorporates a lot of it into her life. For more info, check out PossumLiving.net or this thorough review. There’s also a delightful 3-part documentary made after the book’s publication, which can be found on YouTube here.